Before we move forward to live our best lives in 2014, let’s recap some of the happenings in 2013 right here in BigFatPurse. This model portfolio invests $500 in STI ETF on a monthly basis. Dividends are reinvested too. 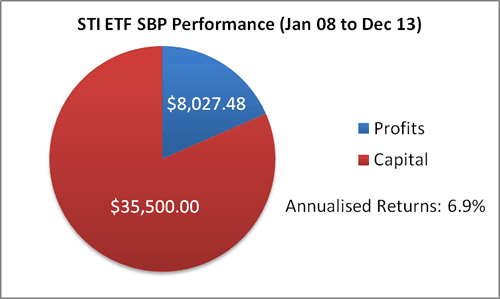 This portfolio returned 6.9% between the period of Jan 08 to Dec 13, compared to STI returns of -1.5%. This is because Jan 08 is the start of the stock market crash and hence, STI ETF was considered high in price and spacing out the investment dollars as the market drops will beat lump sum investment. However, during market low in 2009, lump sum investment will beat dollar cost averaging. Hence, as a smart investor, only space out your investment by dollar cost averaging if you think the market is on the high side. 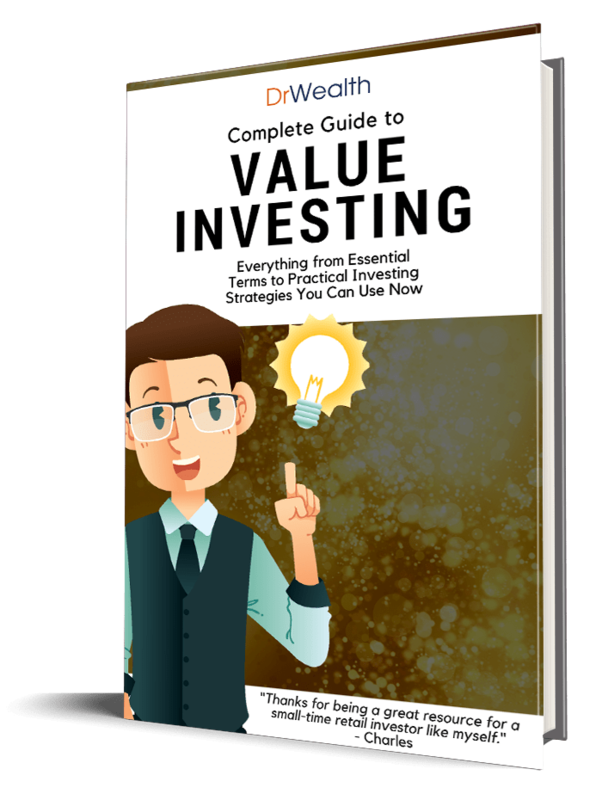 In 2013, OCBC and POSB has introduced their versions of dollar cost averaging investment plans to retail investors and I did a comparison of these monthly investment plans and explained why I preferred POEMS. This model portfolio consists of STI ETF, 30-year Singapore Government Bonds and SPDR Gold ETF and the modelling started from Jan 12. 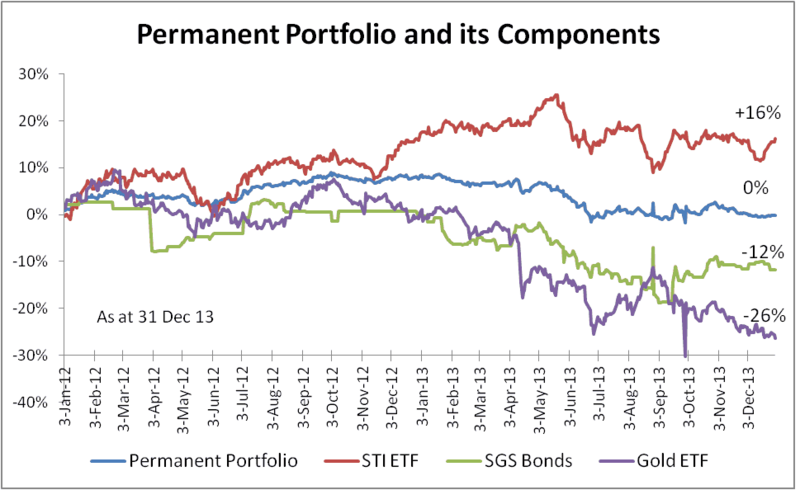 Gold and bonds had a terrible 2013, while STI ETF was pretty flat. 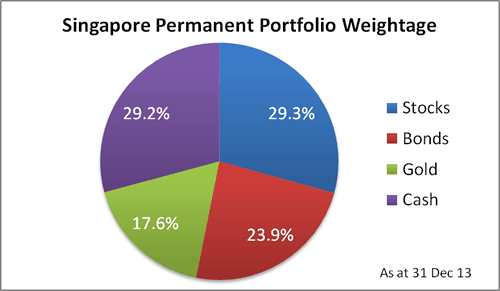 From inception to date, Singapore Permanent Portfolio has been flat at 0% returns. Some may doubt the effectiveness of Permanent Portfolio. Casting a judgement so quickly means they fail to understand the concept of Permanent Portfolio. First, Permanent Portfolio is a capital gains portfolio and not a cashflow portfolio. In other words, the returns from PP comes from buying and selling of the individual components and not by dividends or coupon payments. This means that in peaceful times (without market crashes), there are no buy and sell signals in the portfolio and hence, no profits. Second, Permanent Portfolio is a crisis lover. Most of PP gains are made during buying and selling during crisis. For example, if gold drops further, say below US$1,000 per ounce, PP may signal to sell some stocks and use part of the cash component to buy gold. Some profits are taken from stocks to buy gold low. And when stocks come down and gold goes up, it will present the next round of profits. PP wishes market crashes to happen more often because more profits can be made. If market crashes happens every year, it is possible for PP to have 20% returns. The composition of the Permanent Portfolio as at 31 Dec 13 is shown in the chart below. Gold is nearing the 15% re-balancing point. As mentioned earlier, PP investors need to watch for further price drops in Gold and re-balance the portfolio when required. Permanent Portfolio FAQ – Should you aim for higher Bond Yields? I have been selling options for the entire 2013. It wasn’t easy for the first half of the year as I was getting familiar with it. I have paid the school fees and even now I am still learning new things. I am happy to see that I only have 1 losing month, and at a small cost, in the later half of 2013. As I mentioned in an earlier article, I am positively surprised I could recover the big loss in Apr within 2013. I thought I could only achieve it in early 2014. Hence, the overall returns for the year of $517.11 was good for a first year options selling student. For trading, I always held the belief that it should be done for income. It should be approached as a series of consistent and small wins within short periods of time. It is more important to make a few percentages a month, like what Alex wrote about – Does A 2% Return Sounds Boring To You? Personally I am aiming for at least 3% returns per month from options trading as part of my income. I prefer to structure a portfolio to invest for capital growth. We started writing more about our perspective of value investing later part of 2013. Be assured, this will be a focus area in 2014. Meanwhile, enjoy these timeless articles! Invest in Assets or Earnings? Lastly, the 10 most read articles by you 🙂 Thank you for the support! How to buy Singapore Government Bonds? I was pleasantly surprised by our ability to churn out so many informative articles in 2013. I didn’t realise the amount of work we have done if I had not compile the articles. It was an eventful 2013 and we can’t wish for it to be better. We are going to give you much more and much better educational investing content in 2014! We can’t wait to get started! Hi Alvin, just wondering for the Permanent Portfolio strategy, would it be better to re-balance say once or twice annually rather than waiting for one asset class to hit the 15% mark? Should the trend reverse (or a crash happens) before the 15% point is reached, the asset allocation will adjust itself back again, thus have to wait even longer for re-balancing. I did not back test the frequency of re-balancing. When an asset reaches 15% of the portfolio, this means the asset has actually crashed about 45% and hence, it is a very low price to buy. Similarly, when an asset reaches 35% of the portfolio, the asset has risen about 40% and it is time to take some profits. Time must be given to allow these asset prices to move and it makes sense to buy or sell near the extreme price range of each asset classes. For example, if you re-balance early and sold some stocks, you will have a smaller share base to reap the profits when stocks continue to go up.